A monument erected in honour of those who fought in the Warsaw Uprising of 1944; the small museum next door was set up by surviving combatants of the Uprising and mainly for them too, much less so for foreign tourists, but it may also be worth a quick look. 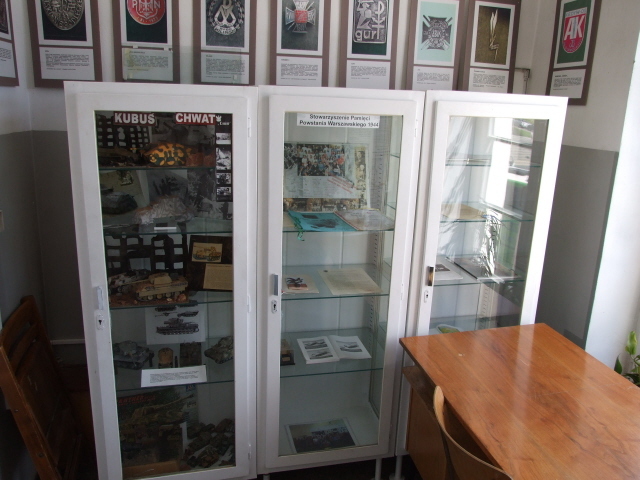 More background info: For historical background see the relevant section in the entry for the Warsaw Uprising Museum. 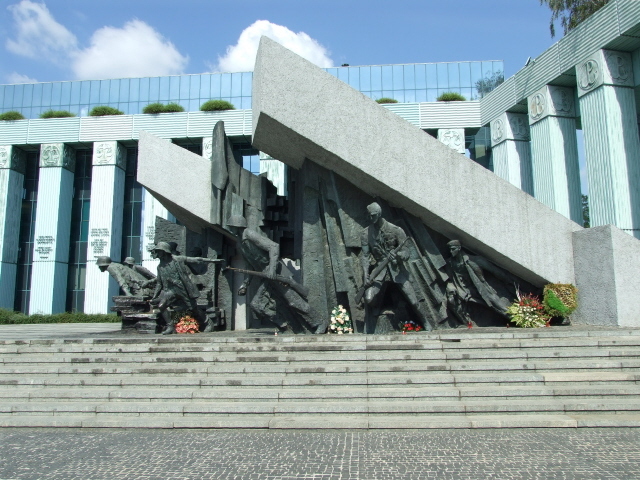 The complex of monuments referred to here simply as "The" Warsaw Uprising Monument is actually one of many such monuments dotted all over Warsaw, but it is certainly the biggest and most prominently located one. The place was also the scene of some of the fiercest fighting in the Uprising. Most of the monuments commemorating the general Warsaw Uprising of 1944 are comparatively recent, including this one, which was unveiled as late as 1989. During the communist era and the Cold War under Soviet dominance, the story of the Warsaw Uprising was not openly commemorated or much talked about. This is due to the fact that it was a sensitive subject from a Soviet perspective, in as much as it includes the fact that the Soviet Red Army had already reached Warsaw in the summer of 1944 but just stayed put on the other side of the river and did nothing to support the Polish insurgents or intervene when the Nazis brutally retaliated. In fact, surviving members of the Polish Home Army AK were persecuted and many sent to gulags in Siberia by the Soviets, who were well aware that the AK fought not just against the Nazis but also for national independence. But Stalin was definitely not having any of that. To this day, the subject is a delicate issue in Polish-Russian relations. Nor is the Uprising Monument free from controversy. Commissioned still under the communists in the late 1980s, not everybody is happy with its design. Artistically I can't personally see anything outstanding about the monument, neither in a positive sense, nor can I seriously find much fault with it either. After all, it's just another monument celebrating soldiers' heroism in bronze form. In that form it cannot be more than just a symbolic representation. If you really want to learn about the Uprising and its historical background and aftermath then you have to go to the Warsaw Uprising Museum. What there is to see: The Uprising Monument is actually a complex of two separate monuments and also comprises the square in front of it, as well as a row of columns and the wall to one side. 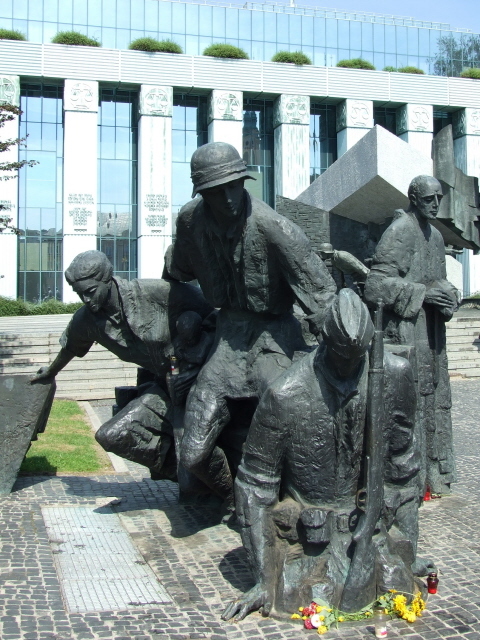 The larger monument, which sits on top of a raised area reached by wide steps from the square, consists of a group of bronze soldiers emerging from under two huge slabs of concrete. The figures are carrying guns – ready for battle. This group is flanked at the back on two sides by a row of blue columns bearing the Warsaw insurgents logo and various inscriptions, as does a brick remembrance wall that forms the north-eastern fringe of the whole complex. Behind this group is the shiny modern National Court/Palace of Justice/Supreme Court building, along one side of which the row of blue columns continues. To the right at the bottom of the steps leading down from the larger monument is another group of bronze statues. This sculpture depicts a group of insurgents ready to go down a manhole into the sewer system. The sewers were indeed used during the Uprising for travelling between parts of the city otherwise inaccessible to the insurgents above ground. They also provided an escape route for many of the survivors. This fact is further commemorated by a street-side plaque on the corner of ul. Dluga and ul. Miodowa to the south of the monument(s). A building at the eastern end of the square in front of the monument complex, on the corner of ul. Dluga, opposite the Garnizonowy church, houses the small Union of Warsaw Insurgents Museum. There isn't actually that much to see inside; basically you go up a staircase the walls of which are adorned with the pennants of various subgroups/divisions of the AK, i.e. the Polish Home Army that led the Uprising. 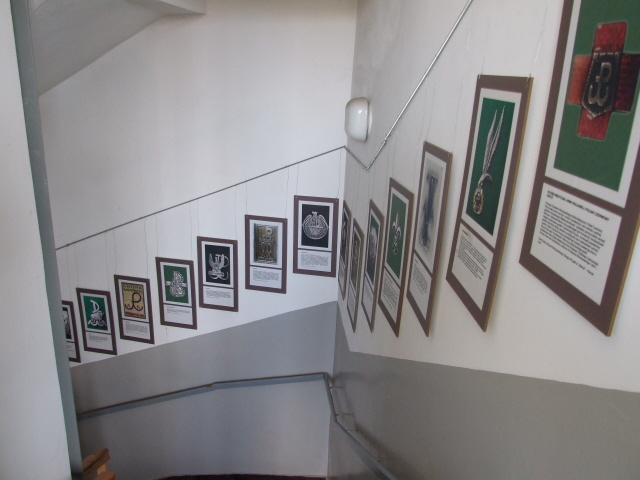 Upstairs there are a few photos and artefacts on display, descriptions are mostly in Polish only, and you get the feeling that the place is really intended just for Poles. So for a foreign visitor a much better place to go to in order to really learn about the Uprising is the Warsaw Uprising Museum to the south-west of the city centre. Location: on Plac Krasinskich, to the north of the corner of ul. Dluga and ul. Miodowa, very close to Warsaw's Old Town. Access and costs: quite easy to get to and free. Details: easily walkable from Warsaw's reconstructed Old Town, e.g. from the Barbakan, the reconstructed brick gatehouse and fortifications at the north-western entrance to the Old Town, and at the end of Podwale; follow ul. Nowomiejska up to the corner of ul. Dluga and turn left. From there it's less than 100 yards to Plac Krasinskich and its Warsaw Uprising Monuments. Access by public transport is provided by buses – several lines go past Plac Krasinskich, including Nos. 116 and 122 which go all the way down Krakowskie Przedmiescie and Nowy Swiat and on to Plac Na Rozdrozu (near Szucha) and beyond. Access to the monument(s) is free at all times; the Insurgents Museum is open Mondays to Thursdays 11 a.m. to 4 p.m. and also free. Time required: A visit just to take in the complex of monuments shouldn't normally take long, 10 to 15 minutes will probably do. The Union of Warsaw Insurgents Museum is unlikely to require much more time than that either, unless you can read Polish, that is. Combinations with other dark destinations: A thematically related must-see is, obviously enough, the Warsaw Uprising Museum. This can be reached quite comfortably from the Monument by walking down to the al. Solidarnosci thoroughfare and hopping on a No. 32 tram, which goes right past the Uprising Museum. A couple of bus lines (116 and 122) connect Plac Krasinskich with the south of central Warsaw and go all the way down to Plac Na Rozdrozu, from where it is only a short walk to the Szucha prison museum. Closer by, a walkable few hundred yards towards the west is the Ghetto Trail, and just beyond that the Pawiak prison museum. A little further away, right by the ramparts of the Old Town on Podwale is a famous small monument known as the "Little Insurgent" ('Maly Powstaniec' in Polish): a bronze statue of a young boy soldier holding a gun and wearing a steel helmet that is far too big for his little head. 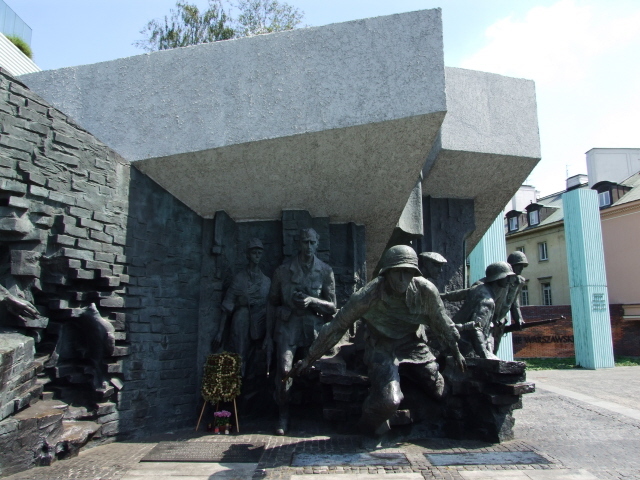 Combinations with non-dark destinations: in general see Warsaw – the Uprising Monument is just outside Warsaw's Old Town, the prime tourist draw. From there, the central tourist route leads along Krakowskie Przedmiescie and Nowy Swiat all the way south to the commercial centre of the city. To the north of the Uprising Monument lies the Nowe Miasto, the "New Town", which is basically an extension of the Old Town and not really that much newer (despite the name). But it's much less touristy and overcrowded, nor as overpriced. (If you ask me, the whole of the reconstructed Warsaw "Old Town" is basically a fake and a rip-off.) .